Welcome to AD LIB, a chef driven restaurant located in Coral Gables rooted in authenticity and home of the pleasantly unexpected. 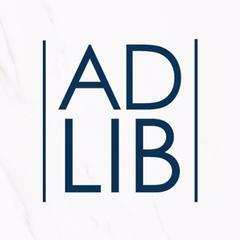 AD LIB fosters a humble and understated elegance discovered best by those with a refined attention to detail and curiosity for all things culinary. This neighborhood place of gathering is not just the place to host out of town guest, business acquaintances, close friends or special celebrations but the perfect place for any type of moment that brings people together. <br> <br>AD LIB brings an elevated but approachable menu, led by Executive Chef Jamie DeRosa and team of James Beard recognized Chefs and talent. Menus resemble a sophisticated playfulness created with the philosophy of, wild caught fish and seafood, responsibly sourced meats and local produce from farms throughout the seasons. Ad Lib defines Modern American cuisine drawing inspiration from some of the most pleasantly unique niches within art, agriculture, entertainment and lifestyle, a true testament to the melting pot palate. This genuine modern American menu will keep you coming back but it is the culinary AD LIB that will serve the possibility for a new taste experience every visit. We look forward to you joining our table. - Live at will. Eat uncommon. –<br> <br>*Ad Lib – impromptu - roughly translates to “at will” in Latin<br><br><br>The Bar Back is responsible for assisting bartenders during the course of business while maintaining a clean and organized work environment. The bar back’s primary objective is to stock the bar with prepped ingredients, keep bar area clean, and assist guests if needed. In addition, all Barbacks must be able to service guests in a courteous, timely, and professional manner while ensuring his/her outlet is clean, organized, and properly stocked at all times. All duties are to be performed in accordance with departmental and property policies, practices, and procedures. <br><br>Requirements <br>To perform this job successfully, an individual must be able to perform each essential duty satisfactorily. The requirements listed below are representative of the knowledge, skill, and/or ability required. Reasonable accommodations may be made to enable individuals with disabilities to perform the essential functions <br> • Must possess a positive attitude and work well with other team members.<br> • Must be able to work unsupervised. <br> • Be able to work in a standing position for long periods of time.<br> • Be able to safely lift and easily maneuver trays of food frequently weighing up to 50 pounds <br> • Be willing to follow direction and ask questions for clarification if needed. <br> • Be able to work in a fast-paced restaurant environment <br> • Basic understanding of kitchen work and food preparation <br> • Understanding of health department regulations and sanitation guidelines.<br> • Ability to take initiative and exhibit flexibility. <br> • Ability to assist Bartenders on the execution of service and follow the Bartender's direction. <br> • Effectively communicate with management, bartenders and service staff in order to fulfill and address any issues or needs requested by guests and or other employees. <br> • Excellent customer service skills. <br> • Have interpersonal skills to deal effectively with all business contacts. <br> • Professional appearance and demeanor. <br> • Able to effectively communicate in English, in both written and oral forms. <br><br>Responsibilities <br> • Clean all equipment, tools, and supplies and maintain and ensure that equipment is in good working order.<br> • Greet guests in a positive, friendly manner and make them feel welcome. <br> • Maintain the cleanliness and appearance of the bar. <br> • Stock the bar with supplies necessary for service. <br> • Complete opening side duties which includes: checking quality and amount of all bar stock and supplies through checklist; setting up bottles in display cabinet and speed rail; checking condition and cleanliness of blender, shaker and other tools; checking temperature of refrigeration units and glass wash machine. <br> • Re-fill ice coolers, garnish trays, straws and napkins. <br> • Perform all opening and closing duties based upon shift assignment. <br> • Bid farewell to guests, using guest's name when known, and encourage them to return. <br> • Anticipate the guests' needs and respond appropriately with a sense of urgency. <br> • Work as a team, assisting all guests' and employees' needs and inquiries. <br> • Follow all procedures and policies set forth by the company, division and department.<br> • Follow all health and safety regulations. <br> • Perform other job-related duties as assigned. <br><br>Working Conditions <br> • While performing the duties of the job, the employee is regularly required to stand, use hands to handle, or feel objects, tools, or controls; reach with hands and arms; talk or hear; and taste or smell. <br> • While performing the duties of this job, the employee is regularly exposed to heat from the stoves and burners. <br> • The noise level in the work environment is usually loud. <br> • The employee frequently is required to walk. <br><br>Preferred: <br> • High school diploma or equivalent. <br> • Previous experience working in a similar bar or restaurant setting.<br><br>50 Eggs inc Corporate Headquarters and Test Kitchen (coming soon) will be a place where chefs and epicureans from all over the world can come together and share their love for cuisine and draw inspiration from one another, creating classic renditions of dishes, giving them the opportunity to explore the flavors of cuisine as one culture. Ad Lib is posting their hospitality jobs on Harri.